Global and equitable access to investigators. 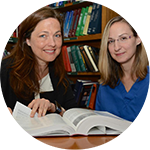 The BRPC is based in the Department of Pathology, has dedicated staff, and is under the direction of Shannon McCall, PhD. Primary customers of the BRPC are the Disease-Specific Working Groups of the Duke Cancer Institute (DCI), who govern collection priorities and distributions for their groups. With the BRPC, all DCI members have access to robust, gold-standard biobanking and protocol development services and, with the approval by the relevant disease-site group, to use of human biospecimens relevant to a wide range of cancers. The BRPC functions under a single IRB protocol focused on banking "excess" and limited "additional" specimens for research. “Excess tissue” can be immediately obtained in conjunction with surgical resections through our close association with the Department of Pathology. "Additional tissue" may also be safely obtained during biopsy procedures in which the patient has consented for an additional biopsy to be taken for research. Concordance between research and diagnostic biopsy samples is ensured by our pathology staff. Patients will also consent to have their medical record accessed by BRPC staff for limited sample annotation. Our group provides biospecimen inventory management of frozen samples, paraffin-embedded samples, fractionated blood components, daughter specimens, and derived specimens including DNA and RNA. As part of our CAP-accreditation and association with the Department of Pathology, every solid tissue specimen we bank is histologically verified with annotation of tumor content and digital photographic documentation. Prestigious College of American Pathologists Biorepository Accreditation ensures quality and patient safety. The BRPC is helping the DCI disease-specific working group develop their own individual tissue repositories using a centralized and common infrastructure. These repositories are "owned" and governed by these working groups and banking priorities and specimen release is regulated under their governance, by a governance body. Each governance body should include representative of all areas of practice (surgeons, oncologists, pathologists, and basic scientists). Requests for tissue banking or tissue release should be submitted through your DCI working group; more specifically through your group's governance body. Governance bodies receive, evaluate, and approve requests from members of their working group before submitting requests to the BRPC for processing. If your discipline's working group has not established a governance body, please take this opportunity to discuss this banking project with your working group leader. A list of disease-specific working group leaders is provided below. Whether the patient needs to be consented to this protocol by the BRPC staff or if your working group plans on handling the consent for your patient. Consent for tissue collection can occur in two ways. A BRPC staff member consents the patient. BRPC staff, upon receipt of a banking request form indicating the need for consent, will identify an appropriate time and place for pre-operative consent based on the patient's upcoming appointment schedule. If rapid same day patient identification and consent is required, BRPC staff can be alerted by pager: 919.970.4731. However, we cannot guarantee availability with less than 24 hour notification. Individuals from disease-specific working group consents the patient. Qualified individuals from the disease-specific working group may be trained on consenting and added to the BRPC protocol. Once trained, these individuals, if part of the clinical practice, can consent patients in a manner that is most convenient for the workflow of physicians in the clinic. Contact the BRPC Staff or at 919.684.6928 for more information about option 2, or to request a training session for consenting on the BRPC protocol. Consent for the BRPC protocol can be obtained using two different consent forms. Excess tissue consent: Consent of patients using the excess tissue consent form allows for the banking of excess tissue that would otherwise not be used for diagnosis. Example: excess tissue is banked for research after a surgical resection of a large primary lung carcinoma in which only a small amount of tumor would be used by the anatomic pathologists to render a diagnosis. "Additional" tissue consent form: This consent allows banking of material from additional passes during a diagnostic biopsy procedure. Example: additional needle core biopsies of a breast mass. Will allow for the option of peripheral blood collection, provided the patient agrees. It is important to note that every "additional" tissue collection from the patient solely for banking requires a new consent event. Provide a Hematoxylin and Eosin (H&E) stain on banked tissues. Have these H&E's reviewed by a board-certified pathologist with clinical privileges at Duke Hospital. Correlate the histologic findings with the histologic finding for the associated clinical diagnostic case for the patient. Ensure that the tissue banking event does not interfere with the quality or accuracy of the diagnosis rendered for the clinical diagnostic case for the patient. Return banked tissue to the clinical case for the patient if required for accurate diagnosis. Process a piece of neoplastic tissue to RNA and DNA. Release tissues at the request of the DCI disease-specific working groups either as de-identified tissue or with a link to the patient identity (tissue release linked to PHI requires separate IRB review and approval for your specific project). The BRPC would be happy to provide additional information. If you would like a complete copy of our research protocol, to see if it would meet your needs, please contact the BRPC Staff or at 919.684.6928.